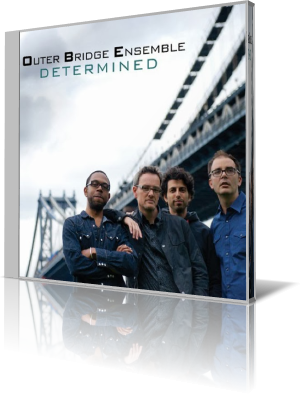 The Outer Bridge Ensemble has spent more than a decade performing at jazz venues and festivals in North America and Europe. With a reputation for drive and excitement, the group captures those elements with Determined (2013). The group consists of Mark Dejong, saxophones; Steve Hudson, piano, organ and Rhodes; David Freeman, conga, djembe and percussion; and Jerome Jennings, drums and percussion. Guest musicians are bassist Soren Nissen, trumpeter James Zollar, trombonist Carsten Rubeling and guitarist Oren Neiman. The title song is a moderate groove with a hint of funk. Dejong’s tenor leads the way with solid work from his bandmates. Hudson’s organ solo is reminiscent of some of the classic rock solos of the 1970s, like “Green Eyed Lady” and “Hold Your Head Up.” Neiman contributes with rhythm guitar. “Salute” has a West African/Caribbean vibe that relies heavily on the percussion instruments. The horns add a soulful vibe like one might expect from horn bands like Tower of Power, the Isaacy Hayes orchestra, Earth, Wind & Fire or Brass Construction. Rubeling delivers a throaty solo, followed by Zollar. Both are accompanied by the same groove of percussion, Rhodes and guitar. The overall impact is intense and engaging.